Develop a new idea, or figure out why that old one isn’t quite working. Our workshop-style classes, practical lessons, and one-to-one consultations will help you get your feature or television script ready for agents and studios. The Italy writing retreat consists of discussion and analysis of your project by our leader and teaching assistants, and collaboration with your fellow students. We’ll focus on exchanging ideas and pages so that you feel inspired and productive. We offer practical exercises to hone your writing skills and teach you a few tricks of the screen trade. Our skills-based mini-lessons will tackle specifics such as subtext, stakes, beginnings, creating characters that pop, “getting in late and getting out early” from a scene, defining relationships, being precise and concise, and much more. For new material, we will guide you through assembling a script, from pitch to outline to completed scenes. If you’d like to perfect an existing project, we will break it down and put it back together again, giving you insight into what works and what doesn’t, so that you can leave with a strong, streamlined screenplay that you’ll feel confident handing over to any agent or studio in town. Also, you’ll be away from your daily grind working against a backdrop of beautiful landscapes, delicious cuisine and inspiring culture – ITALY! You’ll have the option of writing breaks ranging from town walks, to cathedral and underground city tours, wine-tastings, and other exploration. Read more about what to expect in Hal Ackerman’s Q&A. See Registration to sign up. We may modify any of the above, at our discretion, taking student preferences into account. We will also offer group outings to local places of interest. Our past students have a lot of wonderful things to say about us – see Alumni Testimonials. Also check out our Yearbook photo albums and Liz Hara’s blog about her experience. To maximize your time, your workshop leader may ask you to submit story outlines, beat sheets, or treatments in advance. As part of the application, you must submit a brief description of the project you would like to tackle in Italy. You may change your mind, as long as you discuss the switch in advance with our leader. To apply, see Registration. We are a paperless program. All submissions and exchanges of pages will be electronic. You will need a reliable laptop and a screenwriting program capable of converting files to PDF format for distribution. A tablet with an application like Good Notes or Final Draft Reader may be helpful. Please note that PageCraft instructors are working writers. It has not yet happened, but there is always the possibility that a teacher may be pulled away unavoidably due to the demands of an employer or a creative project. In such an event, we will make every effort to bring in a qualified replacement. Q: What’s your favorite piece of advice for writers struggling to crack a story? Theme is your nemesis. We are taught from the earliest Aesop’s fables that stories must have a moral. That notion often filters unconsciously into our creative process. Thinking about theme is limiting dramatically. Not that a story shouldn’t have a theme. But it should not be the driving engine of story birth. You, the writer, should not know what the theme of the story is until it has revealed itself through the act of writing. Instead of the STATEMENT of theme, substitute the QUESTIONS: Whose story is it? What does the character most want? What are the interior and exterior obstacles that will prevent that character from successfully achieving it? What will that character DO to overcome those obstacles? Q: What are some of the most common mistakes you see? There are mistakes in concept and in execution. Conceptually: Incomplete stories. I don’t mean scripts that don’t get finished. I mean a writer not having a complete sense of what a story IS. Of how many scenes and events go into a feature film. One-dimensional characters. Characters who the writers think must be only likable. Common mistakes in technique include: Over-written narrative descriptions. Too much micro managing of characters’ behavior; the writer telling the actors how their facial expressions and actions of various appendages should express the writer’s emotion. Scenes without conflict, where the immediate needs of the characters do not define the action, but where what the writer wants the scene to accomplish gets in the way. Q: Why is a good structure so important to a script? More so than any other common writing form (novel, play, poem) a screenplay’s basic premise and its narrative structure are its two most important elements. It’s sometimes helpful to think of a screenplay as a small business plan, for that is the way its potential financiers will see it; i.e. : How can this “product” be effectively marketed. It is perfectly appropriate and desirable for you to see your work as an offering from your heart and soul. You must also see it as your buyer will see it. If you were fashioning and offering for sale a coffee cup, no matter how original and beautiful it was, it still would have to hold liquid, not transfer heat to the hands, be of a useful size and weight, and made of material that would serve all its purposes. Q: You’ve taught at UCLA for a long time, running the screenwriting program for years. What has changed most for aspiring writers in that time? Other than their getting younger, they have far more technical and business savvy. As helpful as that sounds, it can be a detriment. Writing a script to chase a popular trend is often self-defeating. By the time you’ve written that script, that pipeline is nearly always already filled. I believe a better and more profitable strategy is to write something more personal, something nobody else in the universe can write, even if it doesn’t fit a trend, so that it showcases that ineffable, individual thing called YOUR VOICE. It may very well garner you an assignment to begin your career. Q: What can writers expect from the screenwriting retreat in Italy? To leave as better writers than they were before they came. Q: What part of the program are you most excited to share with the group? I love the creative interaction of people working with full and open hearts to do their best work. Seeing with new fresh eyes. The excitement of discovery. 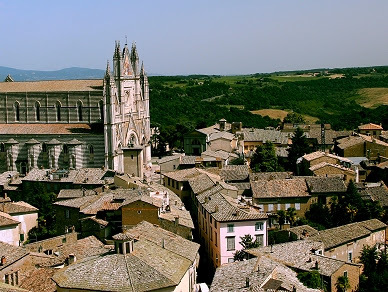 We hope you’ll join us in Orvieto this September and grab some of that excitement for yourself and your writing.